Today I want to share a PicoSure laser case study of a “shaded” tattoo removal. Generally speaking, these tattoos are some of the easiest to remove. There are many reasons for this but much of it has to do with the lighter amount of ink that’s used, combined with the fact that shading isn’t always placed as deeply as say, dark black outlines, for example. This “Ghost” tattoo was located near the right shoulder blade and measured approximately 10” tall by 6” wide. Because of the size of the tattoo, the treatment time was somewhat lengthy and intricate. Unless you find a PicoSure laser provider who takes their time and is extremely thorough, strategic and meticulous, the tattoo will fade unevenly and require more treatments than are actually needed. Total removal of this tattoo required only 4 treatments. More than 90% of the ink was gone following the 3rd treatment. The final treatment was only used for touching up stray ink. The patient was very happy with the result and his skin was left undamaged thanks to the lightning-fast picosecond pulse of the PicoSure laser that creates a powerful PressureWave to shatter the ink in to the smallest of particles which can then be easily carried away by the body. Conversely, old-technology POS Q-switched lasers have a greater risk of damaging the skin due to the slow pulse and high energy requirements necessary to attempt removal. 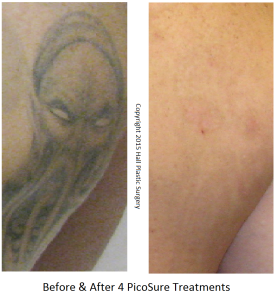 Because Q-switched lasers take way more treatments than PicoSure lasers, a patient’s skin will often scar and have residual ink called a tattoo remnant. If you’ve tried unsuccessfully to remove a tattoo you know what I’m talking about. If you want to fade or completely remove your unwanted ink with PicoSure I can be reached in Austin, TX @ my new location: Austin Medspa 512-479-9997.